It doesn't look or act like most breast cancers. But inflammatory breast cancer may just hold the secret to understanding what happens when any breast cancer turns deadly. When you think of breast cancer, you probably picture a telltale lump. 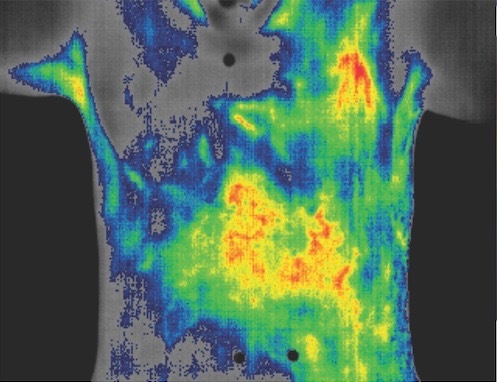 Gayathri Devi, PhD, dispels that image with a few photos: a person’s chest with what looks like a rash, then a thermographic version of the image showing the heat from elevated blood flow spread throughout the chest. This is inflammatory breast cancer (IBC). Most patients with IBC don’t have a single tumor mass that can be isolated and removed. Instead, the cancer appears as clusters of tumor cells called tumor emboli that infiltrate the skin and lymphatic vessels of the chest. “It’s highly diffuse, so that even if you collect the tissue, there are hardly any tumor cells in the biopsy,” says Devi, an associate professor of surgery and pathology. And, patients are treated with chemotherapy and radiation before surgery, which adds to the lack of tumor samples for research. Devi is developing better ways to sample, image, and understand IBC, enlisting help from researchers and clinicians in many other fields. IBC is studied by only a handful of groups in the world, in part because it is rare. But it is the most aggressive form of breast cancer. IBC accounts for only about 6 percent of all breast cancers in the United States but causes 10 percent of the overall breast cancer deaths. McCall, MD, Director of the Duke Biorepository and Precision Pathology Center, who work to increase banking of patient tumor samples. It is IBC’s differences that may hold the key to understanding all types of metastatic breast cancer. One characteristic that makes any breast cancer more likely to spread is if it invaded the lymphatic system. And about 95 percent of IBCs have already done that when diagnosed. Rather than spread through a single cell that travels the bloodstream, most IBC travels in clusters, via vessels in the skin that carry lymph—a fluid that contains immune system cells whose very job is to fight intruders. “How do these tumor clusters and tumor cells not only survive in that environment but also invade and go into different organs?” Devi says. the disease from bedside to bench, then back,” she says. They take cell samples from patients, grow them in these models, then look for activation or inhibition of genomic and protein markers that regulate the cancer cells’ ability to survive, proliferate, and become invasive. Then the team will determine if patients express those same markers. The hope is that the markers that ring true in both the models and in the patients will be targets for better treatment. Inside the body, IBC cells are accustomed to the “shear stress” of the lymphatic system—the movement of lymph flowing through vessels in the skin. 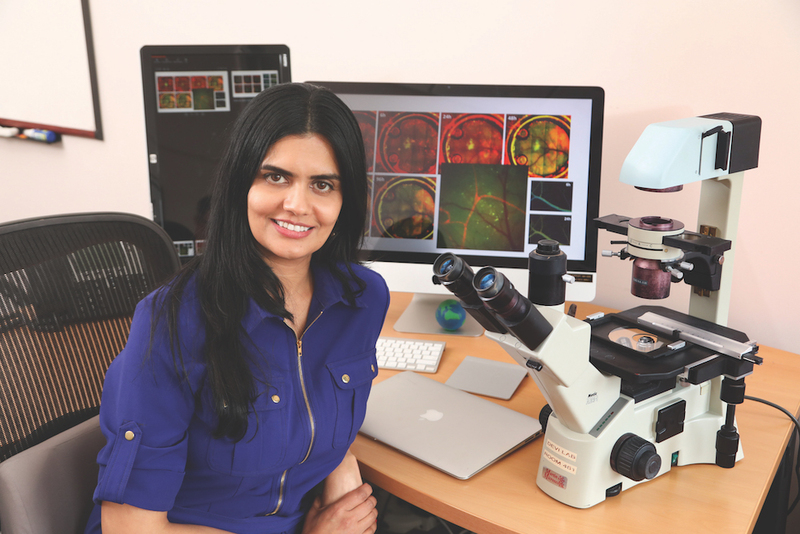 Devi’s cell-culture IBC model uses machines to mimic that motion, enabling the researchers to study the actual formation of the tumor emboli— a hallmark of IBC. Using these more realistic models, Devi has found that IBC is very good at escaping a tightly controlled process that our bodies use to get rid of abnormal cells, called programmed cell death. “To maintain homeostasis and cell populations in tissues, millions of our cells die every second and are replaced,” she explains. To escape cell death, her laboratory has found, IBC cells take advantage of a process that normal cells use to survive during times of cellular stress, called the adaptive stress response. “The cancer cells are changing and adapting and signaling in the tumor microenvironment such that they are basically saying, ‘Bring it on, I’m going to use this fundamental cellular process to my advantage.’” If Devi could shut down that ability, she could slow down IBC and make it more sensitive to anti-cancer drugs. Join the Fight: You can help defeat aggressive cancers like inflammatory breast cancer. To give, visit DCI Development.